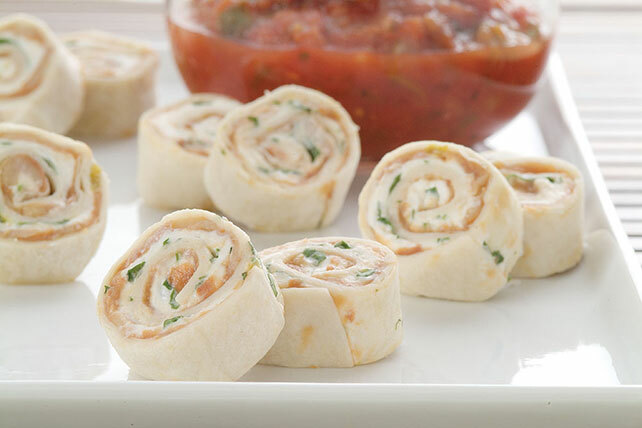 Bring a tasty Tex-Mex appetizer to game day with PHILADELPHIA Creamy Tortilla Roll-Ups. These tortilla roll-ups are a great appetizer with refried beans. Mix cream cheese and garlic powder until blended. Spread tortillas with beans, then cream cheese mixture. Top with cilantro; roll up tightly. Wrap individually in plastic wrap. Refrigerate 30 min. Cut each roll-up into 10 slices. Serve with salsa. Prepare using canned refried black beans.